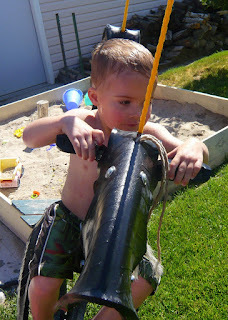 here are a few pictures of wesley's fun day at grandma's. 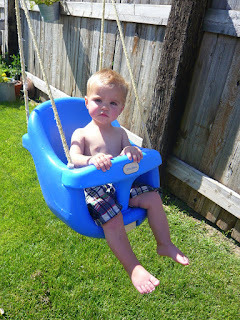 doesn't he look so LONG in this swing! my baby is growing up. 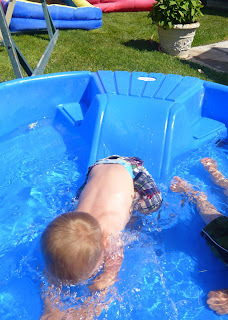 wesley preferred the kiddie pool to the banzai. 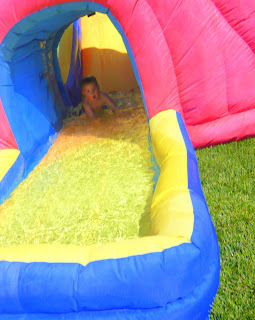 by the end of the afternoon he had the slide perfected. 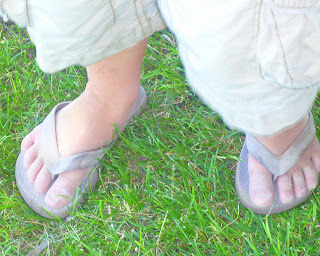 but, his first few tries weren't so graceful. i know. my posting has been in the lacking department this month. it's not that we haven't been having fun. it's just that i haven't been hauling my camera around. but, you are lucky! friday afternoon my mom held a private banzai party just for owen and wesley (it wasn't really "private", but we were the only ones there so we can call it what we want) and i dusted off the camera for it! 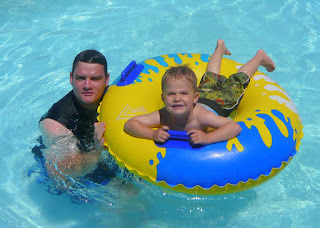 owen had a BLAST! 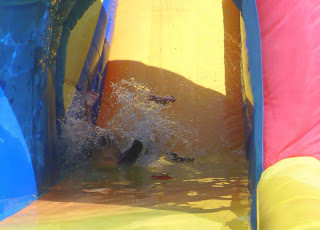 owen's graceful descent down the little slide...face first...with his mouth open. 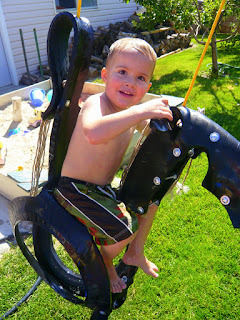 owen taking grandma's pony for a ride. 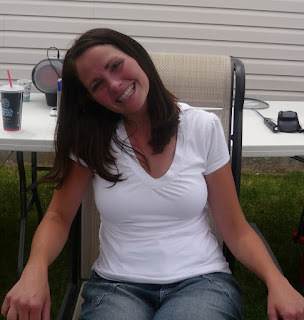 my little sis, melissa, turns 28 today! 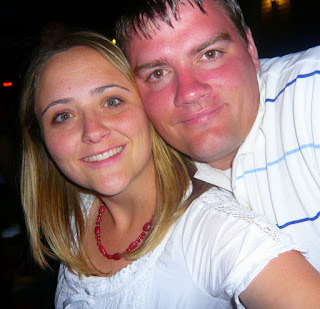 melissa is beautiful, fun, out-going, hard-working, and a great mom for her four boys! i ask myself on a VERY regular basis what melissa would do to entertain her boys on days when me and my boys are going stir crazy. 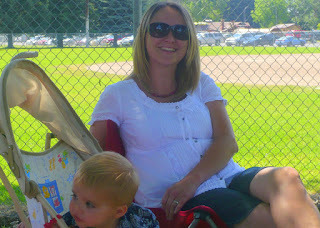 melissa is always doing fun things for her boys and keeping their little hands and minds busy! thanks for being so wonderful melissa! i certainly look up to you. happy birthday! happy birthday to my niece, alex! she turns 13 today. i was shocked to find a picture of her where she wasn't covering her face. i must have been really on one during the 4th of july to be able to pull this of! you are beautiful, mature, smart, athletic, and fun! we hope you have an extra special day today! happy birthday! happy birthday to kyle! he will be marrying kevin's sister in 2 WEEKS! we are so excited to have him as a part of our family! 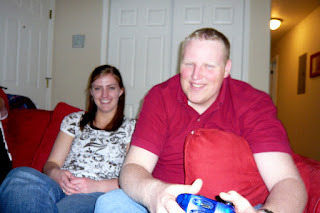 kevin couldn't be more excited to have a sports-loving, x-box playing, golfer join his side of the family! happy birthday kyle! happy birthday to my niece, gabby! she turns 3 today! gabbers is the sweetest, most well-behaved 3 year old i know! you hardly even know when she is around. such a good girl. 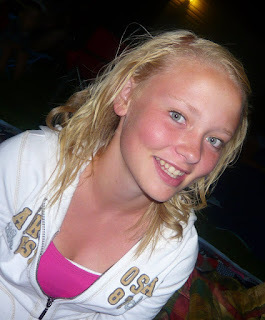 we love you gabby! happy birthday! sunday was actually owen's birthday and even though we did most of the celebrating on saturday there was still fun to be had on sunday! kevin and i were up late preparing talks for church saturday, getting owen's cake made and decorated, wrapping presents, and the decorating the house. and it was all worth it! owen woke up so excited! owen blowing out his candle. 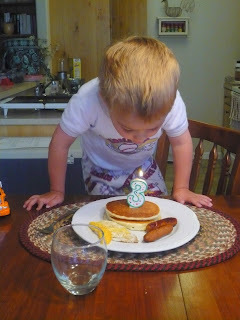 kevin made him a YUMMY birthday breakfast! 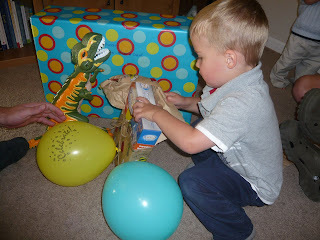 owen unwrapping some of his presents. he totally scored! 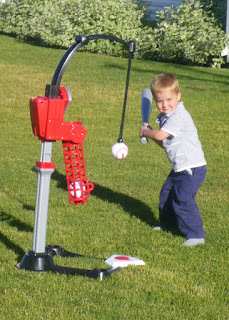 owen has been asking for better batter baseball since he first saw the commercial in JANUARY! he was super excited when he unwrapped this present (and so were all the neighbor kids). i have so many great pictures from swimming so i had to include another collage. thanks to everyone that came to support owen at his party! it was such a great time! 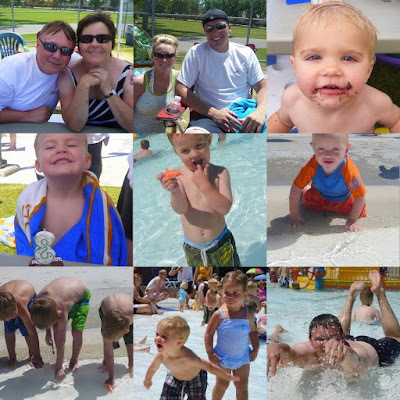 saturday we held owen's 3rd annual ross park swimming party! 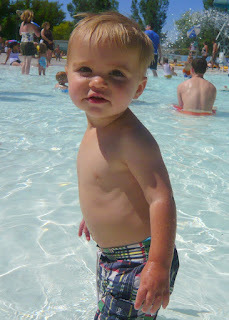 owen (and everybody else in my family) looks forward to his birthday weekend for this reason...SWIMMING! we love it! 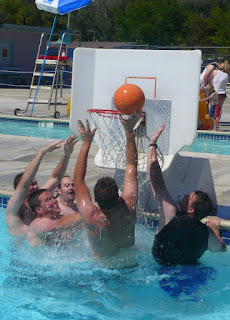 this year we had a great turn out from my family and we also had a few friends join in on the fun. it was the best year yet! 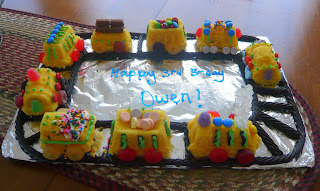 today owen turns three! we have had WAY too much fun celebrating his birthday all weekend (those posts to follow) but before the day was over i wanted to get this montage posted! 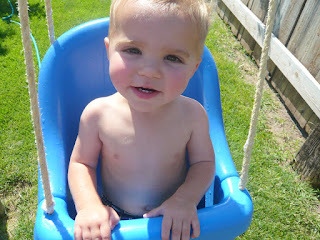 we love this little guy and CANNOT imagine life without him...or really remember life with before him! we love you buddy! and thank you for bringing us so much joy and happiness every day! happy birthday to my brother-in-law, aaron! 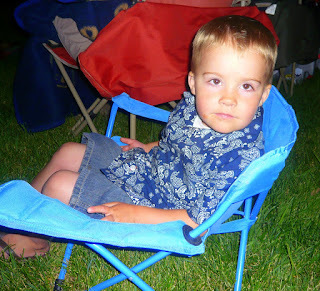 this is kevin's older brother and i really don't have very many pictures of him so i decided if i had to go digging for one i would go WAY back! this picture is from 2003 when their baby brother, sam, got married in new york. happy birthday aaron! hope you had a great day celebrating the BIG 3-1! 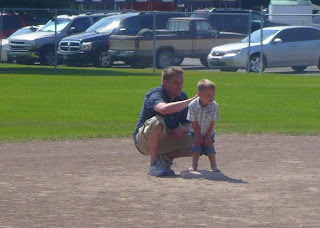 happy birthday to my brother-in-law, chris! 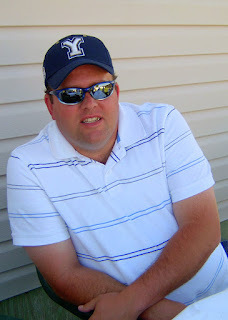 avid sports fan and proud daddy of FIVE girls! we always have a great time when we visit chris! he certainly knows how to entertain (and makes a mean breakfast). we hope you have a fantastic day chris! happy birthday! saturday night we had another bbq at my parent house and played some volleyball and other yard games. 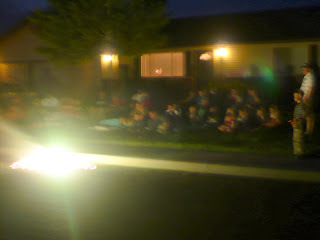 once it got dark enough we drove over to ben and kaylin's for our own firework show. we had quite a crowd, and i guess we were a little rowdy (manwarings rowdy? !...hard to believe) and a VERY NICE police officer drove past and asked us to wrap it up. luckily, we were just about done. so, we pulled our the sparklers and then called it a night! the party didn't stop there. sunday morning we all drove to blackfoot for truman's baby blessing. 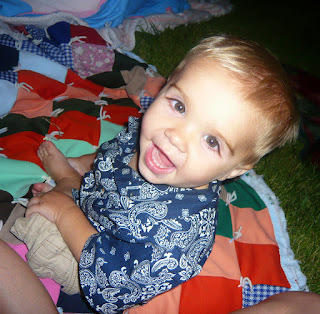 truman was so precious and justin and amber stuffed us full of yummy food! we had such a fun weekend. it was so great having everyone home! this gets us even more excited for the gregg manwaring reunion next month! see you all then! more pictures from saturday. after playing hard we all rushed to the caboose (a snowcone shack...actually it's in an old caboose...that jarom and elena's neighbors own). needless to say, they were a little overwhelmed with our large army so elena hopped onto the caboose and started making snowcones. she was so cute in there with her notepad and mixing up drinks. i wish i would have taken a picture. i think this picture is so cute. 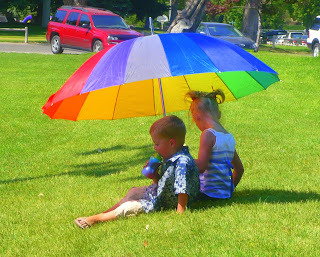 owen sharing some shade with halle. me and wes enjoying the shade. wesley on the way home. 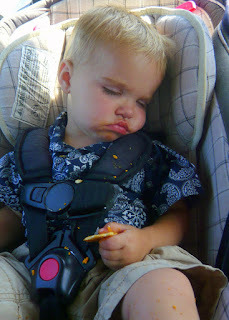 he was wiped out...and a mess! 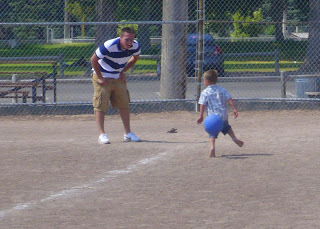 we can't go to a park without playing kick ball. and we couldn't have asked for a better weather for a day in the park! owen taking a break on the side lines. he wanted to stay right in the action. brandon and ogden. ogden narrowly escaping the ball with a leap! what an athlete! blake and ogden. 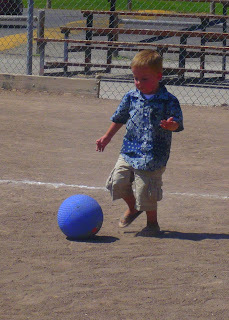 no messing around with ogden...and keeps his eye on the ball and is ready to run. he cracks me up!